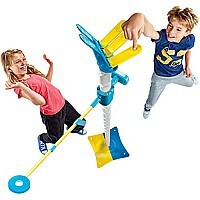 The horizontal limbo pole spins around the center post, getting lower and lower. Two players must duck under or jump it. So the question remains, "How low can you go?" It's action-packed and laugh-aloud fun!